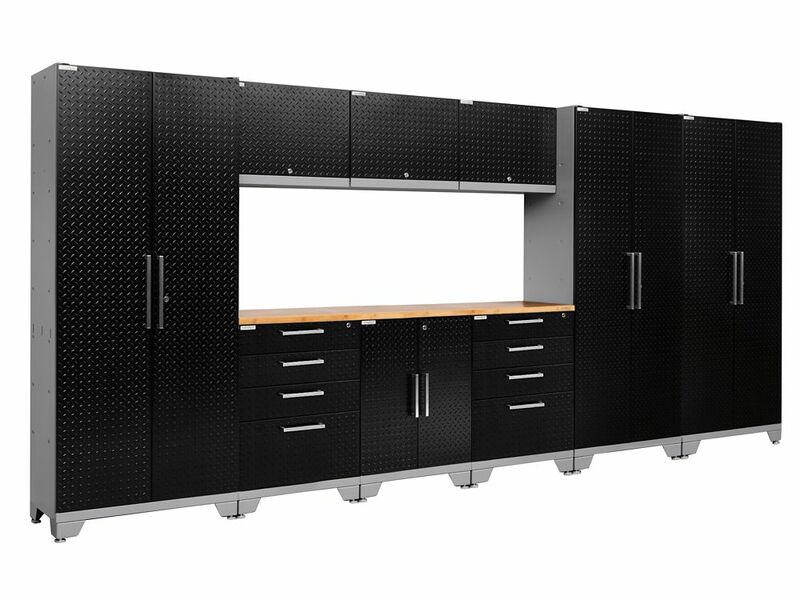 Performance 2.0 Diamond Plate Black Garage Cabinet Set (10-Piece) Get all those cables, decorations, and gardening tools off your garage floor and into NewAge Products newly redesigned, Performance 2.0 Series modular garage cabinetry. These cabinets are built to last with their fully welded, 24-gauge steel frames and fully lockable, double walled doors. Our configured sets are shipped with adjustable steel shelving; easy-to-grab stainless steel handles and height adjustable leveling legs that accommodate uneven garage flooring. The manufacturers limited lifetime warranty gives you the insurance that your cabinets will look great for years. Performance 2.0 Diamond Plate Black Garage Cabinet Set (10-Piece) is rated 4.6 out of 5 by 5. Rated 5 out of 5 by Yardguy from Garage organization Very satisfied. Was able to track cabinets and delivery company called and set up a small window for delivery time. Driver was very friendly and helpful. Everything arrived undamaged. Assembly takes a bit but was expected. High quality. Rated 5 out of 5 by Yardguy from Shipping was fast. Delivery driver was very helpful and courteous. Product arrived very well pac... Shipping was fast. Delivery driver was very helpful and courteous. Product arrived very well packaged and damage free. Took the better part of 8 hrs by myself to unpackage and assemble and install with about 30 minutes from a friend to install the 3 upper cabinets. Very pleased with the quality and look of the cabinets.